There's been a lot of coverage of growing home ports in the southeastern states - Charleston (SC), Jacksonville, and Mobile. Each is working to some degree or another for more or larger ships, and still other ports are marketing themselves to cruise lines looking for their first ship. Generally, there's excitement in those ports. But for all the excitement there is in those ports, there's a bit of uneasiness a few hundred miles to the south in the larger ports of Port Canaveral and Tampa. The complete article appeared in the June 4, 2010, edition of Cruise News Daily. Norwegian Epic is now home to the largest LED chandelier ever installed on a cruise ship. The three-week process was completed at the STX Europe yard in Saint Nazaire (France) where the ship is in the finishing process for handover later this month. A larger photo appears in a newsfile on the CND website. The complete story appeared in the June 4, 2010, edition of Cruise News Daily. CND subscribers also read about Twiggy christening a cruise ship ... and a new entertainment alliance between Royal Caribbean and Dreamworks Animation. Details appeared in the "Other Things You'll Want to Know" column in the June 4, 2010, edition of Cruise News Daily. Norwegian Cruise Line announced the latest addition to their lineup of entertainment options for Norwegian Epic, and it's one that may cause you to scratch your head. For just $10 a day, you will be able to rent a Gibson guitar to play in the privacy of your cabin aboard NCL's newest ship. This may not seem too newsworthy, and in reality, it's probably not, but it is another sign that it's going to be "different out there" (to quote an old, old NCL advertising slogan) on Norwegian Epic. In this CND article we see how NCL is continuing to expand the appeal of Norwegian Epic to a market beyond the traditional cruise market - one that is used to vacationing a very different way. The complete article appeared in the June 3, 2010, edition of Cruise News Daily. + and Crystal scheduling a jazz cruise in the Caribbean. Details of these items appeared in the "Other Things You'll Want to Know" column in the June 3, 2010, edition of Cruise News Daily. Celebrity Cruises has a new celebrity chef program that launched this week called "Savor Your Destination." Unlike other celebrity chef theme cruises, Celebrity's twist is that their program won't be a "name" chef doing a cooking demonstration, and a special menu one evening which he has put his stamp of approval on. Instead, Savor Your Destination promises much more interaction with the chef at various events, as well as a chef-created menu. The complete article appeared in the June 2, 2010, edition of Cruise News Daily. Disney Dream is still eight months away from its maiden voyage, so it is nowhere near complete, but a major milestone was achieved in its construction earlier this week. A ship's hull is composed of giant blocks, which are preconstructed and then fitted together into place in the drydock like a giant jigsaw puzzle. 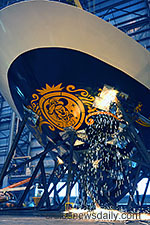 Disney Dream is composed of 80 blocks, and the final one, this time the bow, was lifted into place in Meyer Werft's huge covered drydock at their Papenburg (Germany) facility. The complete article appeared in the June 2, 2010, edition of Cruise News Daily. Photos are in a newsfile on the CND website. CND subscribers also read about Carnival again declaring a dividend for investors ... Bermuda putting out the welcome mat hoping to mend fences for a special group ... Mitsubishi readying a return to building cruise ships ... and AIDA planning way in advance for a christening extravaganza. Details appeared in the "Other Things You'll Want to Know" Column in the June 2, 2010, edition of Cruise News Daily. Royal Caribbean International released some enhancements to their Crown & Anchor Society loyalty program for past passengers today, the first of several announcements to come. If you were expecting more free stuff - free meals in the specialty restaurants, big discounts on your bar bill, or special treatments in the spa - you'll be disappointed. What comes with this first announcement are some services, which Betsy O'Rourke, RCI's SVP of Marketing, says have been requested by members, and the company has heard them. The changes have come as the result of several months of talking to past passengers asking what they want in the C&A program. The complete article appeared in the June 1, 2010, edition of Cruise News Daily. The Role of the Travel Agent? When Royal Caribbean announced some of the enhancements to their Crown & Anchor loyalty program, many of them were connected to booking subsequent cruises onboard their current cruise. "Our members like to book onboard," Lillian Murphy (RCI's VP of One-to-One Marketing) said. "That is something that has come through very clear from them." That surprises me for a couple of reasons. In this CND article, we look what Royal Caribbean says their customers are saying about the role of the travel agent in the transaction. This week, an episode of the series "World's Toughest Fixes" will show the series' host, Sean Riley, getting involved in some of the more unusual jobs in the drydock. In one segment, he helps strip and power wash the ship's hull. In another he's working high up on the ship with another team which is sealing the windows. Then it's back to the bottom of the ship when he crawls inside the tail shaft housing to show viewers the mechanical work being done there. For a break, he also gets to try his hand at some of the upholstery work completed during the two-week time in drydock. There are behind-the-scenes photos of the World's Toughest Fixes crew at work during the shoot are available on the Princess Flickr photostream. The Sea Princess episode of World's Toughest Fixes airs June 3 at 9pm ET/PT on NGC. This article appeared in the June 1, 2010, edition of Cruise News Daily. Holland America has added some interesting new photos of the underside of their newest ship, Nieuw Amsterdam, to their blog. The ship is in drydock at Fincantieri's Marghera (Italy) yard following sea trials for hull painting. Nieuw Amsterdam will enter service in July.